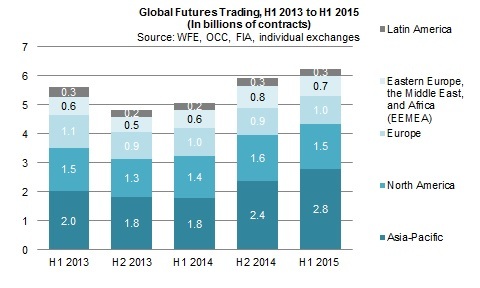 The Asia-Pacific contributed nearly half of global futures volume during the first half of 2015. Boston, November 3, 2015 – Post-crisis regulatory developments have brought complex and challenging issues to listed derivatives markets, resulting in analysis and strategic planning from the buy-side and sell-side as well as market infrastructure providers and technology vendors. At the forefront of financial markets’ innovation since the early 1980s, this industry will undoubtedly make further advances as the new regulatory environment sets in. But what are the key drivers for future growth, and where will the next opportunity come from? This report highlights some of the major global trends in listed futures and options trading and explores and identifies opportunities and challenges that will shape the listed derivatives industry. It is based on publicly available market data, macroeconomic data, and information as well as interviews with industry experts primarily at relevant listed derivatives exchanges from July to September 2015. This 50-page Impact Report contains 31 figures. Clients of Aite Group’s Institutional Securities & Investments service can download this report.